The Town of Odyssey • View topic - The Town of Odyssey Turns Twelve! The Town of Odyssey Turns Twelve! Post subject: The Town of Odyssey Turns Twelve! I am pleased to announce that the ToO has officially turned twelve! Woohoo! This allows for awesome alliteration. It has been twelve years since Shadowpaw started this amazing board! Every year it gets more unbelievable that the ToO has been around for so many years and still has a number of original members, and is still gaining new members, not to mention all the people in between! You guys are all awesome! Thanks to Dan for providing his traditional special anniversary surprise! I find myself particularly fond of this endeavour, for some mysterious reason. 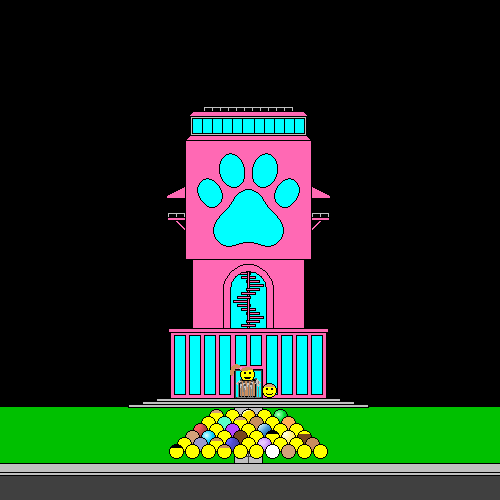 It's the Paw HQ! Click here to see the thread that contains all the images of the construction process. Don't let the smileys down after all their hard work - go take a look! Post subject: Re: The Town of Odyssey Turns Twelve! Does Corey even like pink? It's unbelievable in the sense that it's hard to believe so much time has passed, but it's not unbelievable we've lasted all that time. This is a very unique and special corner of cyberspace with a caring community of special people, that's why it's still going strong. ...And if he doesn't, too bad for him. I really like the way you said this, bookworm. I think you're absolutely right! Post subject: Re: teh Town of Odyssey Turns Twelve! This is place is getting up there in internet years and regular years alike. Wow! The building looks amazing!!!!!! That's a nice building we got here. PARTY TIME!! !